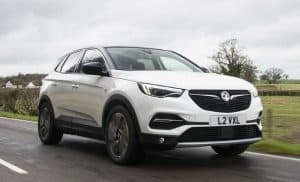 An all-new low-emitting diesel engine has made its way into Vauxhall’s Grandland X SUV. Available to order now with deliveries from July, the 129bhp Euro 6.2-compliant 1.5-litre turbodiesel emits just 108g/km of CO2 whilst returning 68.9mpg on a combined cycle when specced in the SE trim. The engine comes linked a new quick-shifting eight-speed automatic gearbox, which features an optimised torque converter to improve gear shift smoothness and reduce idling vibrations. Vauxhall says the new diesel’s power output means it can compete with many range-topping two-litre engines, delivering improved driving response and a driving feel that is more reminiscent of a petrol engine than an oilburner. Meanwhile, an effective emissions reduction system helps it meet strict environmental requirements and effectively treat NOx, helping contribute to improved fuel economy. Prices for the 1.5-litre diesel Grandland X start at £24,190 for the SE model.